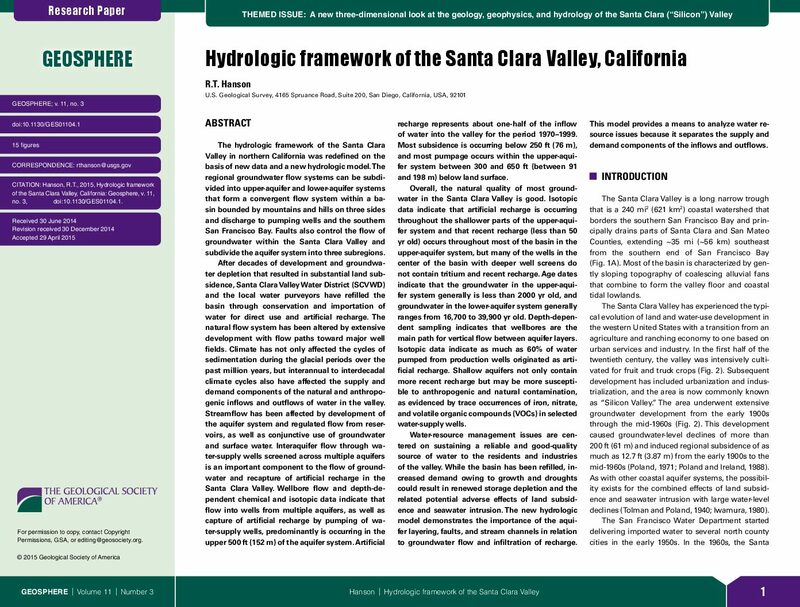 The hydrologic framework of the Santa Clara Valley in northern California was redefined on the basis of new data and a new hydrologic model. The regional groundwater flow systems can be subdivided into upper-aquifer and lower-aquifer systems that form a convergent flow system within a basin bounded by mountains and hills on three sides and discharge to pumping wells and the southern San Francisco Bay. Faults also control the flow of groundwater within the Santa Clara Valley and subdivide the aquifer system into three subregions. After decades of development and groundwater depletion that resulted in substantial land subsidence, Santa Clara Valley Water District (SCVWD) and the local water purveyors have refilled the basin through conservation and importation of water for direct use and artificial recharge. The natural flow system has been altered by extensive development with flow paths toward major well fields. Climate has not only affected the cycles of sedimentation during the glacial periods over the past million years, but interannual to interdecadal climate cycles also have affected the supply and demand components of the natural and anthropogenic inflows and outflows of water in the valley. Streamflow has been affected by development of the aquifer system and regulated flow from reservoirs, as well as conjunctive use of groundwater and surface water. Interaquifer flow through water- supply wells screened across multiple aquifers is an important component to the flow of groundwater and recapture of artificial recharge in the Santa Clara Valley. Wellbore flow and depth-dependent chemical and isotopic data indicate that flow into wells from multiple aquifers, as well as capture of artificial recharge by pumping of water- supply wells, predominantly is occurring in the upper 500 ft (152 m) of the aquifer system. Artificial recharge represents about one-half of the inflow of water into the valley for the period 1970–1999. Most subsidence is occurring below 250 ft (76 m), and most pumpage occurs within the upper-aquifer system between 300 and 650 ft (between 91 and 198 m) below land surface. Overall, the natural quality of most groundwater in the Santa Clara Valley is good. Isotopic data indicate that artificial recharge is occurring throughout the shallower parts of the upper-aquifer system and that recent recharge (less than 50 yr old) occurs throughout most of the basin in the upper-aquifer system, but many of the wells in the center of the basin with deeper well screens do not contain tritium and recent recharge. Age dates indicate that the groundwater in the upper-aquifer system generally is less than 2000 yr old, and groundwater in the lower-aquifer system generally ranges from 16,700 to 39,900 yr old. Depth-dependent sampling indicates that wellbores are the main path for vertical flow between aquifer layers. Isotopic data indicate as much as 60% of water pumped from production wells originated as artificial recharge. Shallow aquifers not only contain more recent recharge but may be more susceptible to anthropogenic and natural contamination, as evidenced by trace occurrences of iron, nitrate, and volatile organic compounds (VOCs) in selected water-supply wells. Water-resource management issues are centered on sustaining a reliable and good-quality source of water to the residents and industries of the valley. While the basin has been refilled, increased demand owing to growth and droughts could result in renewed storage depletion and the related potential adverse effects of land subsidence and seawater intrusion. The new hydrologic model demonstrates the importance of the aquifer layering, faults, and stream channels in relation to groundwater flow and infiltration of recharge. This model provides a means to analyze water resource issues because it separates the supply and demand components of the inflows and outflows.